Iceland’s Christmas advert showing the devastating effects of palm oil has been banned from being shown on TV. The advert, which has been viewed more than 30 million times on other platforms, focuses on highlighting the harsh impact palm oil has on orangutan and rainforest habitats. With a public outcry in response to the banning of the ad, a petition to show the Christmas advert on TV has now reached over 926,000 signatures. Clearcast, the body which approves advertisements for TV, disapproved of the ad because it breached political advertising rules in the 2003 Communications Act. Chris Mundy, the Managing Director of Clearcast, said in a blogpost on Monday that “Clearcast does not consider the ad itself to be political”. “Greenpeace need to demonstrate they are not a political advertiser as defined by the Code before Clearcast can approve the ad. In the case of this ad, Greenpeace have not yet demonstrated to Clearcast or the broadcasters that they are not a political advertiser under the definition of the rules”, he continued to say. Palm oil, known as the most commonly produced vegetable oil, is found in 50% of supermarket products – from chocolate to cosmetics. Due to its high demand, it is causing a loss of biodiversity, mass deforestation, and the displacement of indigenous people. For this reason, Iceland teamed up with Greenpeace to raise awareness through the 90-second animated clip. By complying with their partnership with the organisation, Iceland became the first major UK supermarket to remove the oil from all its ownbrand foods. Truthfal asked a few members of the public in outside Iceland in Falmouth about their opinion on the use of palm oil. One lady said: “I tried to stop buying products with palm oil in, when I first became aware of it several years ago and I found it so hard”. Another shopper stated that the ban of palm oil produce “should have been done a long time ago”. 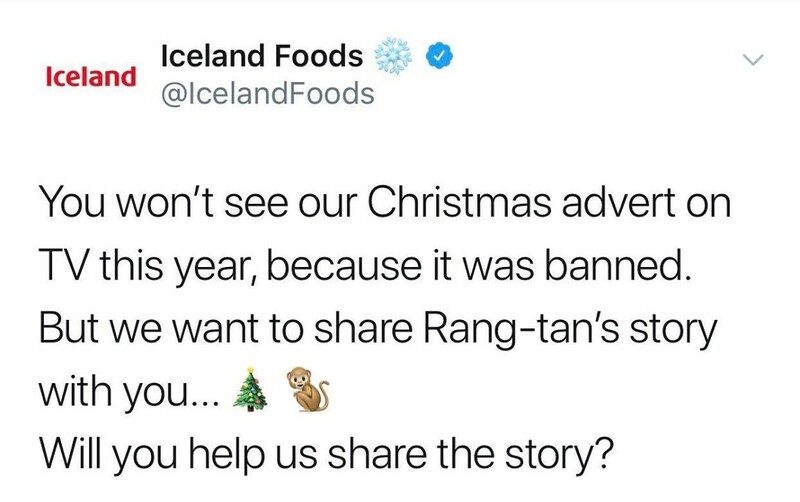 Regarding the ban of the Iceland Christmas advert, another lady said that “they should’ve shown it. It shows the youngsters growing up what could happen and try to do something about it all”. Richard Walker, the Managing Director for Iceland, talked about this choice while speaking on Good Morning Britain on Tuesday: “we’ve taken palm oil out, in totality, of about 450 lines. As of our own labeled products there won’t be any, but then of course we do sell branded products”. When asked how many of the branded products in the store have palm oil in them, his response simply was: “I don’t know the exact number, but it would be a couple of hundred”. Through his statement, the difficult question is raised: If Iceland has partnered with Greenpeace and they feel strongly about combating the production of palm oil, how come they still stock products with this ingredient? Giving the consumer the choice of buying a product with or without palm oil despite their so-called beliefs, Iceland has caused a public debate. They have been accused of deliberately planning an advert that would cause controversy, and get further publicity by doing a ‘heroic act’. Iceland says that for commercial reasons, they have to keep stoking hundreds of products containing palm oil. “We are in business to make money, to make profit. If I just delisted hundreds of products, it would be commercial suicide”, said Walker. Sign the online petition for the Christmas advert to be shown on TV and continue to raise awareness on the impact of palm oil. Add your name to the Greenpeace online petition to tell big brands to stop using palm oil from forest destroyers, and save orangutan’s from endangerment.